The Internet landscape of the Caribbean is small but relatively complex, nascent but constantly evolving. No single organisation holds the responsibility for promoting the growth of an open, stable, strong, affordable and resilient Caribbean Internet; that is a role shared by several. Because the execution of the region’s overall Internet development agenda requires the coordination of separate players, various Internet stakeholders continue to work together to address longstanding and emerging issues. A recently concluded week-long event in Port of Spain is only the most recent example. 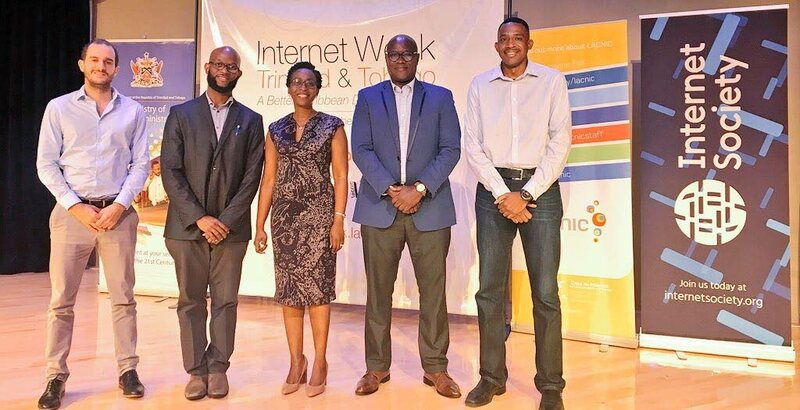 Called Internet Week TT, the four-day event series was held by the Caribbean Network Operators Group (CaribNOG), Google, the Internet Society, and the Latin American and Caribbean Internet Registry (LACNIC), and made possible through the support of the Ministry of Public Administration. A short, formal opening featured remarks by Stephen Lee, CaribNOG; Gabriel Recalde, Google; Shernon Osepa, Internet Society; Kevon Swift, LACNIC; and Shelly Ann Clarke Hinds, Ministry of Public Administration. On October 2, CaribNOG kicked off the week with its 16th regional meeting, an all-day affair which focused mainly on cybersecurity. In typical fashion, presentations by longtime CaribNOG members Steve Spence (Arkitechs Inc.) and Irwin Williams (Teleios Systems) struck a conversational tone, packed with personal stories from the proverbial trenches of network design and software development in the Caribbean. Next, a pair of workshops held jointly by LACNIC and Google aimed to enhance local connectivity and strengthen the ecosystem for entrepreneurs. On October 3, a half-day workshop led by Inés Peralta Agüero, market lead for Central Region and the #Caribbean at Google, focused on how local business owners and start-up founders could make better use of Google’s publicly available digital marketing tools. A parallel LACNIC-Google two-day workshop covered the nuts and bolts of Internet connectivity and traffic optimisation, covering a range of technical issues such as the new Internet Protocol (IPv6), routing security (BGP and RPKI), peering models, open standards and root servers. This interconnection workshop was facilitated by Arturo Servin, manager of interconnection strategy for Africa, Latin America and the Caribbean at Google and Guillermo Cicileo, coordinator, Security, Stability and Resilience at LACNIC, with the support of the TT Internet Exchange. Shernon Osepa, regional affairs manager for Latin America and the Caribbean at the Internet Society, led an afternoon session on October 3, sharing some highlights of the organisation’s ongoing global work in establishing community networks and strengthening the resiliency of telecommunications and computer networks. The topics had special resonance in the aftermath of unprecedented levels of destruction wrought across the Caribbean region by the 2017 Atlantic hurricane season. The region’s threat landscape is constantly evolving, not only as a result of climate change but also as the sophistication of manmade cyber threats becomes more advanced. On October 4 and 5, LACNIC led a closed-door cybersecurity workshop under the umbrella of its AMPARO project, and with the support of the Office of the Attorney General and Ministry of Legal Affairs. AMPARO is an initiative that seeks to address emerging cybersecurity issues across the region and establish Computer Security Incident Response Teams (CSIRTs) within the LACNIC community. The two-day workshop was facilitated by Graciela Martínez, one of the promoters of the AMPARO project and Ernesto Pérez, coordinator of CSIRT CEDIA in Ecuador. Internet Week TT events were held at Government Plaza auditorium and the Attorney General Conference Centre, both located on Richmond Street, Port of Spain. The week-long event followed a similar conference held in Guatemala City in August, with the local support of the Guatemalan telecommunications regulator. Another series will be held later this year in the Dominican Republic. This story was originally published on Gerard Best's blog, SightLine. Reply to "Stakeholders join forces in Internet Week"